The Super Mario Party Best Characters Tier List is based mostly on the Dice Rolls. If a character has a more unique or more effective Dice Roll they will rank higher within this list. Further down we have some of the Best Partner Party Character Combos. Numbers with “-” or “+” indicate a dice roll that will cause either a loss of coins “-5” or a gain in coins “+5”. Plain Numbers indicate the number of spaces you will move on the map. 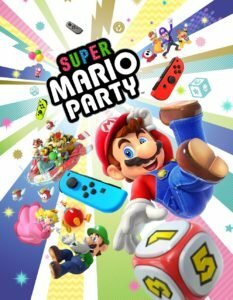 See a Super Mario Party Character you can’t play? Check out how to unlock them all here. Here we will explain how the different spaces you can land on will affect the game or your Super Mario Party Characters. Plus Space: Get 3 coins. Minus Space: Lose 3 coins. Item Space: Pick up helpful items. It never hurts to land here! Ally Space: Calls one new ally to join you! Bad Luck Space: Depending on where the wheel stops, you might lose items or coins. Event Space: Triggers an event on the board. Which event depends on which Event Space you land on. VS Space: Everyone antes coins before facing off in a VS minigame! Lucky Space: Spin a roulette to determine which beneficial effect you’ll activate.